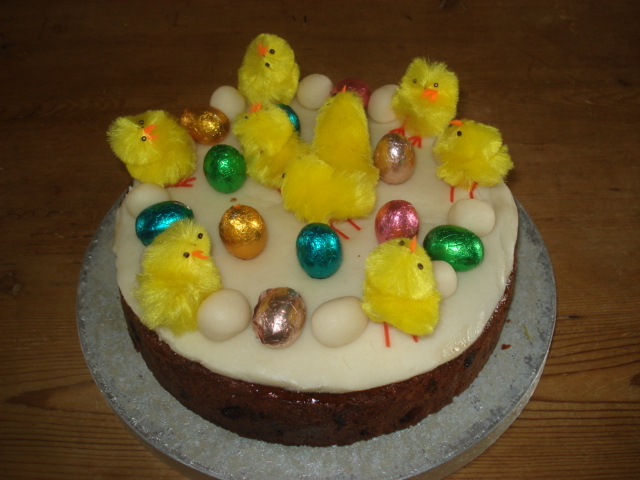 As it is Easter I have made a Simnel cake. Wickipedia tells us that Simnel cakes have been known since at least the medieval time. They would be eaten on the middle Sunday of Lent, Laetare Sunday (also known as Refreshment Sunday, Mothering Sunday, Sunday of the Five Loaves, and Simnel Sunday), when the forty day fast would be relaxed. More recently, they became a Mothering Sunday tradition, when young girls in service would make one to be taken home to their mothers on their day off. The word simnel probably derived from the Latin word simila, meaning fine, wheaten flour. Somehow the tradition moved to Easter and now Simnel cakes are representative of Easter. Conventionally eleven marzipan balls are used to decorate the cake, with a story that the balls represent the twelve apostles, minus Judas. They used to also be decorated with flowers, but I have modernised mine to decorate with chicks and little chocolate eggs. This is the recipe I used as a basis for my cake. 1. Preheat oven 160C/320F/Gas 3. 2. Grease and line the base and sides of an 20cm/8in deep, round cake tin with baking parchment. 3. Cream the butter and sugar and gradually add the eggs and milk. Fold in the flour and all the dried fruit and mix well. Place half the mixture into the prepared tin and level the surface. 4. Take one third of the marzipan and roll into a circle the same size as the cake tin, place the circle on top of the cake mixture. Spoon the remaining mixture on top of the marzipan and level the surface. 5. Bake for about 1 3/4 to 2 hours or until golden brown and firm in the middle. If toward the end of the cooking time the cake is getting too brown, loosely cover with a piece of foil. Allow the cake to cool in the tin before turning onto a cooling rack. 6. When the cake is cool. Brush the top with a little warmed apricot jam. Roll out half the remaining marzipan to the size of the cake and sit it on the top. Crimp the edges of the marzipan. Make 11 even sized balls from the remaining marzipan and arrange around the edge. 7. Brush with beaten egg and glaze under a hot grill for about 5 minutes, turning the cake round so it browns evenly, so the marzipan is tinged brown all over. (You can also do this with a blow torch if preferred). Today was my turn to make small cakes for the “Golden Age Group” that I help out with. This is a club for elderly people in Churchingford every fortnight. They have a speaker, then a high tea of sandwiches, scones and cakes. 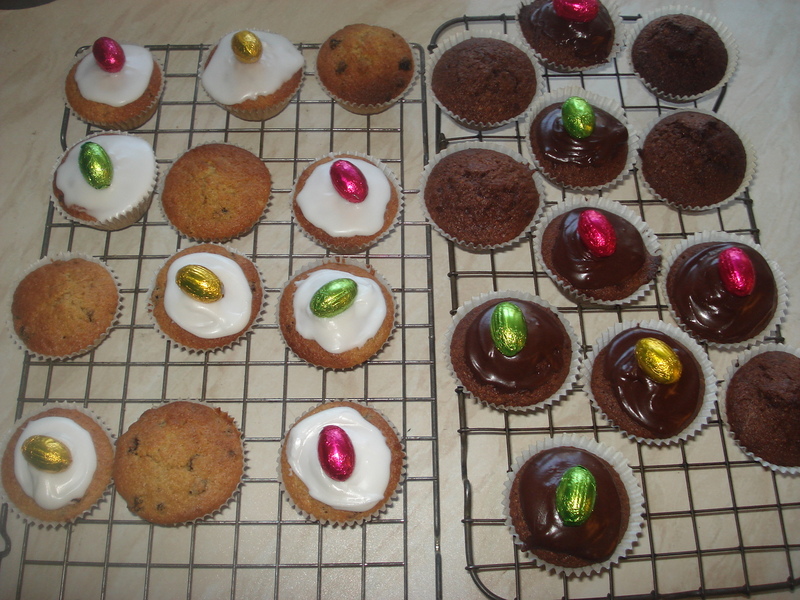 As we have just had Easter I decided to make my fairy cakes with an Easter theme. It is traditional in the UK to have a Simnel cake at Easter. This is a rich fruit cake covered in Marzipan and the traditional decoration for the simnel cake is eleven balls of marzipan arranged in a circle. These represent the disciples – omitting Judas. 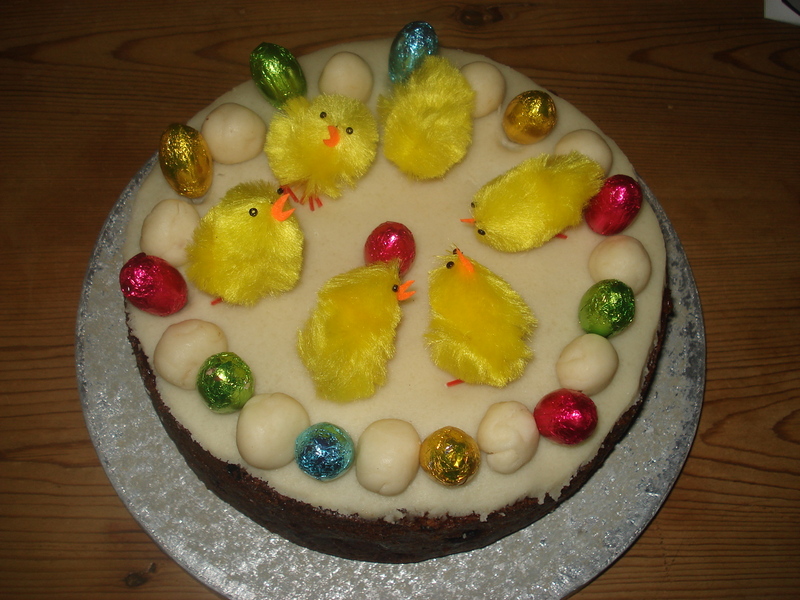 I have also added Easter Chicks and coloured chocolate eggs to my cake. So does this tradition exist elsewhere in the world or is it a very British thing?